Bigger than Vegas. That’s what they say about Macau these days. More is gambled in this former Portuguese colony than anywhere else in the world. There are now more than 40 casinos in Macau, from the gondolas and canals at the Venetian Macau to the world’s best water show at the City of Dreams. The city even has its own version of the Vegas Strip – the Cotai Strip. Which Macau casinos are the best? We’ve picked our five favorites below. This is the biggest casino resort in the world (bigger than anything in Vegas). 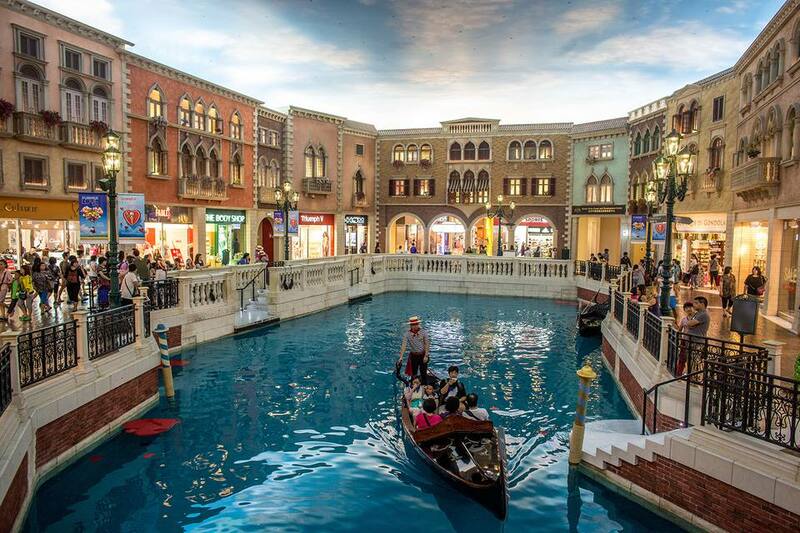 Inside the Venetian Macau, you'll find the regions' premier shopping mall, a 3000 room hotel and gondoliers roaming canals along mock, Italian streets. Many of the visitors are just here to pretend they're in Venice. It's the complete package as a resort; there are shows by night, excellent restaurants and the Venetian hotel is one of the best places to stay in Macau. Utterly over the top and completely fun, this is the best of Las Vegas transported to Asia. Macau’s first destination for grown-up gamblers, the City of Dreams forgoes the gondoliers and gladiators of its competitors to offer a more stylish experience. The gaming floor is one of the biggest and best designed in the city, where you can expect to stand elbow to elbow with high rollers. Michelin-starred restaurants, luxury hotels and the best house show in town are just some of the reasons that the City of Dreams is considered one of the most exclusive casinos in Macau. If you’re looking for the James Bond experience, the City of Dreams is the place to sip your martini. Macau's first Las Vegas-style casino has lost none of its appeal. More down to earth than Venetian and City of Dreams, the live bands and free drinks at the Sands Macau make this an easy casino to spend a few hours. The massive gambling hall has all the appeal of an aircraft hangar, but it does mean there is a wide range of tables and minimum bets that won't break the bank. The location right next to the Macau/Hong Kong ferry pier means it's convenient for a day trip, but it can be swamped on Friday and Saturday night with ​businessmen from Hong Kong. Smaller, but smarter than most of its rivals, the Wynn Macau is where the big rollers go to splash their cash. Million dollar tapestries are stapled to the wall and Qing era vases grace the hotel lobbies, while the designer curves make it one of the most attractive casinos in Macau. Inside you'll find tables with pricey minimum bets and a high rollers room that is said to be one of the most exclusive in the city. It's a casino worth seeing​ but perhaps stick to the slot machines. This is a Macau original. Before the Las Vegas imports arrived, the Grand Lisboa was the biggest deal in town. Its Michelin star restaurant and five-star hotel rooms are a testament to its success. Yet, the Grand Lisboa still remains most attractive because the casino offers less glitz and more gambling. The warren of rooms hide hundreds of tables and plenty of big rollers. The focus is on showing your cards rather than catching a show. This is the best place in town to enjoy the more classical Macau casino experience. What Are the Rules in Macau's Casinos?